Alligators are cold-blooded flesh-eating mostly-aquatic reptiles in the order Crocodilia. 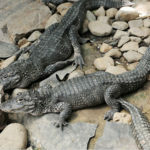 It is common to confuse them with crocodiles, another major family from the same order. Even though they do look similar, there are certain differences between the two, both in their appearance and behavior. Alligators, also notoriously famous for attacking and killing humans and other large mammals, are darker in color with a differently shaped snout. They are native only in certain regions of North America and China. Alligators can be found both in freshwater and saltwater habitats, including rivers, ponds, and lakes, as well as relatively shallow marshes and brackish waters. They also spend considerable time on land, basking in the sun to control their body temperature, or hunting for food. Their diet varies depending on the species, and how old an individual is, though they are carnivores in all stages of life. Baby alligators feed on small fish, worms, crustaceans, and small amphibians. As they grow up, they start hunting larger preys including large fish, turtles, birds, and small to medium mammals like rodents. Adults are not too selective about their food and can hunt anything from fish, frogs, turtles, crustaceans, to other reptiles and small to large mammals. Adult American alligators are even known to attack Florida panthers, black bears, and large dogs. If easily available they even feed on carcasses. Unlike crocodiles, alligators do not consider humans as potential prey, but will still attack humans if they feel threatened in any way. How Often Do They Need to Eat: Being cold-blooded, they do not need to eat nearly as often as warm-blooded animals. An adult may survive on a meal of a single deer for around 5-6 days. These predators have excellent eyesight and are more likely to come on land for hunting during nighttime, typically during the warm seasons. They can move swiftly in water as well as on land, being able to run and even climb quite fast. Alligators are much slower than crocodiles on land, attaining speeds of around 20km/hour. However, there have been reports of them climbing trees for basking in the branches. Capable of holding their breath underwater for 1-2 hours at a stretch, they often remain submerged in water, keeping only their eyes and snout above the surface so they can catch any animal or bird coming close enough. When the temperature goes below freezing point, these reptiles go into brumation, which is similar to hibernation where they reduce their activity to go into a kind of torpor. As their breeding season arrives in late spring, the males engage in activities like mating calls and emitting low frequency sounds to attract the females. After mating, the females build nests in holes to lay 10-60 eggs that hatch after 2-3 months of incubation. The hatchlings are looked after by their mother for about a year after hatching. At times, adult alligators are known to eat their young. If they survive their juvenile years, an alligator can have a long lifespan of about 30-50 years. The oldest living individual is believed to be over 80 years of age, though its actual age is unknown. 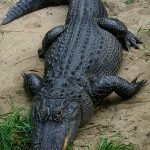 In the US, especially in Florida where people often have to coexist with the American Alligator, it is illegal to feed them as it would diminish their fear of humans and make them associate humans with food. An average American alligator can weigh over 800lbs, while the Chinese species is much smaller with the males weighing no more than around 100lbs. The largest recorded specimen was found in Louisiana, measuring 19.2 feet from snout to tail.